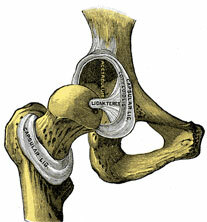 The hip joint is a ball and socket joint consisting of a concave acetabulum and a covex head of the femur. It allows for 3° of freedom which includes flexion/extension in the sagittal plane, abduction/adduction in the frontal plane, and external/internal rotation in the transverse plane. The primary role of the hip joint is to support the weight of the head, arms, and trunk both in the static position and in dynamic postures such as ambulation, running, and stair climbing (1). Injuries and other conditions at the hip can result in a loss of hip range of motion and strength, hip joint hypomobility, and movement dysfunction. According to the Cyriax capsular pattern hip internal rotation and abduction are first lost, with hip flexion being more limited than hip extension (2). A common treatment approach utilized to treat joint restriction and limitations at the hip is joint mobilization. The goals of mobilization are to improve extensibility of restricted capsuloligamentous tissue and to affect the articular mechanoreceptor activation pattern at the joint (3). Joint mobilization has been demonstrated to improve physiologic and accessory motions to hypomobile structures and increase muscular strength by removing the reflexogenic inhibition emanating from the joint mechanoreceptors (3, 4). In a case report by Crow et al. (5) they conducted a study on a 43 y/o male who underwent bilateral hip resurfacing arthroplasty and developed severely restricted hip motion. Utilizing a multimodal treatment approach including exercise with an emphasis on joint mobilization the patient was able to achieve clinically meaningful improvements with PROM measurements and functional activities. The authors noted that further research should be conducted to include multiple individuals with severely restricted hip motion so cause-and effect relationship can be established. In a pilot study by Makofsky et al. (3) they examined the effect of grade IV inferior hip joint mobilization on hip abductor torque. Thirty healthy subjects were randomly assigned to a control group which received grade I inferior hip joint mobilization and an experimental group which received grade IV inferior hip joint mobilization. Their study revealed that there was a statistically significant difference between the two groups for an increase in hip abductor torque and was consistent with other studies demonstrating that the use of a grade IV non-thrust mobilization improves strength immediately post intervention in healthy individuals. In another study by Yerys et al (6), they conducted a study to determine the usefulness of posterioranterior (P-A) hip joint mobilization in improving strength of the gluteus maximus muscle. Forty asymptomatic subjects were randomly assigned to a control group which received Grade I P-A mobilization and an experimental group which received Grade IV P-A mobilization. The results of the study demonstrated a statistically significant difference between the hip extensor torque of the two groups with a 14% increase in strength for the experimental group and only a 4% increase in strength for the control group. Given the importance of practicing based on evidence and the positive findings in the above studies and many more studies, physical therapists should feel comfortable to consider the utilization of hip joint mobilization techniques to facilitate not only increasing range of motion at the hip but strengthening as well. Anterior Glide of the Hip Joint - Patient is lying prone with one or more pillows under the trunk and the hip positioned in abduction and external rotation. Place the guiding hand over the posterolateral surface of the proximal thigh and then the mobilizing hand over the guiding hand. The mobilizing/manipulating hand glides the femur in an anterior direction as the therapist leans on the patient's thigh. Posterior Glide of the Hip Joint - Patient is lying supine and the therapist is supporting the patient's knee with the guiding hand. If conservative techniques are indicated the hip joint is placed in the resting position. If more aggressive techniques are indicated the hip joint is placed in the approximately restricted range of motion. The mobilizing/manipulating hand is positioned on the anterior surface of the proximal thigh. The therapist applies a grade I traction to the joint and the mobilizing/manipulating hand glides the femur in a posterior direction. Distraction/Inferior Glide of the Hip Joint - Patient is lying supine near the edge of the table with belt wrapped around the patient's leg and the therapist's leg. In a lunge position with therapist facing patient, therapist applies a light distraction force by taking taking up slack in the belt while moving the patient's hip into flexion. Lateral Glide of the Hip Joint - Patient is lying supine near the edge of the table with belt wrapped around the therapist's leg and the patient's leg as low as patient comfort will allow. In a lunge position with therapist facing the lateral aspect of the patient, therapist applies a light distraction force by taking up slack in the belt while moving the patient's hip into flexion. 1. Norkin CC, Levangie PK. (1992). Joint Structures & Function - A Comprehensive Analysis - Second Edition. Philadelphia, PA: F.A. Davis Company. 4. Warmerdam A. Arthrokinematic Therapy: Improving Muscle Performance through Joint Manipulation. Wantagh, NY: Pine Publications, 1999:32–44. 5 Crow J., et al. Use of Joint Mobilization in a Patient With Severely Restricted Hip Motion Following Bilateral Hip Resurfacing Arthroplasty. Physical Therapy. 2008;88(12):1591-1600. 6. Yerys S, et al. Effect of Mobilization of the Anterior Hip Capsule on Gluteus Maximus Strength. The Journal of Manual & Manipulative Therapy. 2002;10(4);218-224. 7. Edmond, S. Joint Mobilization/Manipulation - Extremity and Spinal Techniques Second Edition. St. Louis, MO: Mosby Elsevier, 2006.